If you’ve ever worked on filling a parking lot and had to place content one-by-one, you know the time it takes. 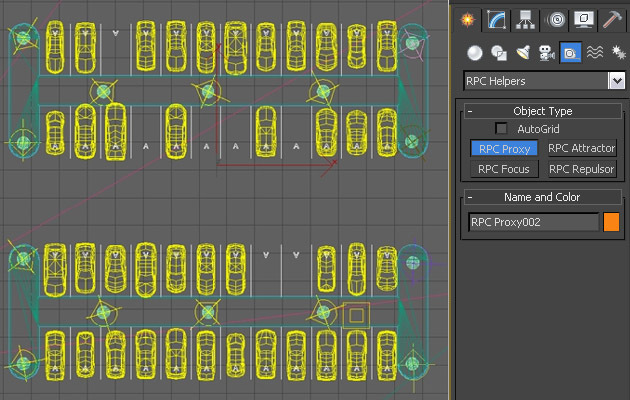 The RPC Plug-ins for 3ds Max and AutoCAD solve that dilemma with the Mass Populate feature. It’s an easy-to-use feature which allows you to place RPC Proxies (place holders) and then easily populate them with RPC Content. The features enables you to control distribution and randomization of RPC Content placement enabling you to get “the right feel” required for your project. Customers routinely share renderings and animations with us (we invite you to share your work). One project that took advantage of the Mass Populate was for one of Disney’s Florida PGA Golf Courses. Renderings and animations included heavily populated tree lined fairways. In a matter of a few clicks, they achieved the desired look using the Mass Populate feature and RPC Trees. And, so can you! Ready to give it a try? I’ve got an easy step-by-step tutorial video for you below and more information in our help documentation.